It is a foggy morning in the Solent and Flight Commander Edward Albert de Lossy de Ville is convinced the fog will lift as he reaches Southampton Water. But when he arrives the fog has not cleared. Horsea Island is littered with wooden aerial masts including three which at 446 feet dominate the Portsmouth skyline. On the ground men at the wireless telegraphy station hear the sound of the plane circling above until the engine noise suddenly ends with the sound of a crash. In spite of the danger of the plane crashing to the ground Able Seaman Nicholas Rath (Royal Naval Reserve) begins to climb as the mist clears. The Sopwith Baby has smashed into the wood frame and is held in position by its propeller. Ordinary Seaman Richard Knowlton and Deckhand George Faucett Pitts Abbott begin to scale the tower behind Rath while men on the ground start to haul up a bosun’s chair towards the stricken plane. When Rath reaches the plane he discovers de Ville unconscious over the lower wing where he has been thrown in the collision. Rath ties the rope around the pilot and the three drag de Ville from the plane and place him the the chair and slowly lower him to the ground. All three men receive the Albert Medal for their bravery. 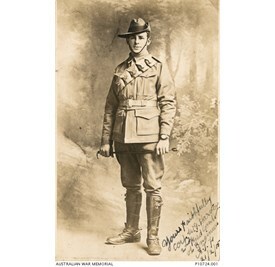 Captain William George Harvey MC (Australian Pioneers) is killed at age 23. He is an Australian Rules footballer for Essendon in the Victorian Football League in 1912. Private George Everill (North Staffordshire Regiment) is shot at dawn at age 30 for going absent without leave. He landed in France in May 1915 and served without confrontation until 16th March 1916, when he faced his first court martial for using insubordinate language to a superior officer. His sentence of one years’ imprisonment with hard labor was suspended. It is supposed that is wife never learned of his fate, because the information volunteered to the War Graves Commission indicated that her husband had been killed in action. His epitaph reads “Thy will be done from his loving wife and children”.